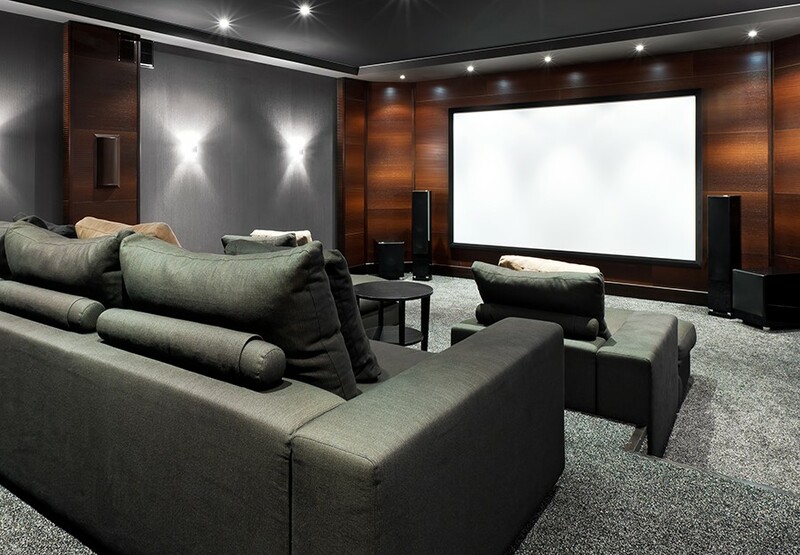 The challenge with media rooms as opposed to traditional home theaters is that they’re often multi-purpose areas. This usually means the room has windows. Natural light is great…until you’re trying to watch a movie and that light is washing out the image on the screen. The solution? You could block off the windows entirely, but that kind of defeats the point of having windows. Instead, my recommendation is to use motorized window shades. The neat thing about smart shades is that you can connect them to your home entertainment system, so that whenever you start to watch a movie, the shades automatically close to completely block out the sun. You get to enjoy the natural light without having to worry about closing and opening the shades throughout the day. How close are your theater seats to the screen or TV? Same question applies to the speakers throughout the room. If the seat placement is off, you won’t get ideal visuals and you might find yourself in an audio dead zone. There’s actually a science to placing seating for home entertainment – an equation based on the size of the screen, layout of room, number of seats, etc. If you want your movie-watching experience to be top-notch, go with an AV expert who puts effort into making sure the seats and equipment are placed correctly. When watching a movie in your media room, what should your focus be on? The obvious answer is the movie, but if you’ve got clunky speakers and a projector jutting out in the middle of the room, those pieces of equipment are probably going to take center stage. The better approach is to install speakers in the walls and ceiling so you can get true surround sound audio without the distracting clutter. I see it all the time: a homeowner hires an AV installer to set up the media equipment, and after that’s finished, THEN they bring in an interior designer to add décor for a specific theme. What’s the problem with that approach? It has to do with acoustics. When the AV expert is installing the equipment, he or she should (if you’ve hired a quality company) optimize everything for the perfect sound and visuals. Everything sounds and looks great…until a bunch of artwork is placed right next to speakers and the seating has to be moved around to accommodate a candy station. The better approach is to bring in the interior designer early into the process, while the AV expert is still installing the equipment. The companies can work together to incorporate all the design elements in a way that doesn’t detract from the audio or visuals. Everybody wins. Media room design can be tricky, but we’ve got the process down to a science. We work with interior designers and homeowners throughout New York to create home entertainment systems that look and sound amazing. Interested? Give us a call, click the chat button at the bottom of the screen, or fill out a quick questionnaire and we’ll reach out to you.